To Angela: Thanks for all your help and great service! Angela, thank you so much for all of the time, effort, and hard work that you invested to help me receive my new 2012 Tiguan! I am absolutely thrilled and know that you went out of your way with a lot of things to help me get exactly what I wanted. Thank you! Thank you to each and every one of you that helped with the finishing touches on my new 2012 Tiguan. I appreciate the hard work, time, and effort that was done and I am thankful for all the details that helped make it look exactly the way I wanted it. Thank you again! I am very happy with my vehicle and look forward to driving it for many years to come. Overall an amazing experience! 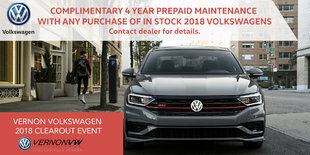 The team at Vernon Volkswagen treated me like royalty, and I am extremely impressed! Especially Angela! She is a rockstar! Thanks team! I love my bug! Thank you again for your help. As I said before, we thought it was so refreshing to deal with a salesman that was not pushy, had a good sense of humour, and that we can actually recommend to friends and family.